Azerbaijani and Armenian media are caught in unique cooperation in building a smear campaign against one of the leaders of Azerbaijani opposition - Ali Karimli. In upcoming November, it is the next parliamentary election in the Republic of Azerbaijan. Finally, after long intrigues and feud, two main (and last remaining) opposition parties were able to come together and form a block for joint participation in the election. 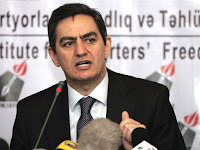 Ali Karimli is one of the leaders of this block and perhaps holds a record for being a focus of numerous smear campaigns sponsored by the government. He also penned the famous op-ed in the Washington Post this April. Now, just a month left to the election, another smear campaign seems to unfold. In short, Ali Karimli is accused of bargaining with foreign powers - if they support him in the upcoming election, he is ready for every concession in the Nagorno-Karabakh conflict. But how to prove this and how to make people believe it? First, you order "The 525th Newspaper" to publish an initial article, where the whole conspiracy is explained - Ali Kerimli will sell Karabakh if “foreign powers” will bring him to power. 525th is allegedly considered a “sold” media in Azerbaijan. “Sold media” is a media outlet that previously was independent, but then unofficially was bought by the government. Now it still poses as independent, but in fact, is controlled by the government. Second, Russian-language news website 1news.az publishes an article based on and citing original material in 525 where they repeat the same allegation – Ali Karimli will sell (if not already sold) Karabakh in exchange for power. 1news.az is a news website controlled by the Presidential Administration. Unofficially, among Azerbaijani journalists, it is referred to as “administration's website”. Third, Armenian media outlets pick up the news and report – Azeri opposition leader is ready to any concession in Karabakh issue, reports Azeri media. PanArmenian for example, cites both 525th and 1news.az. This part of the job is over. Now it is time to inform Azeri people of this evil conspiracy. And our beloved 525th doesn’t also forget about its duty to inform the public about this shocking news – and not surprisingly, it cites Azeri-Press Agency citing Armenian media, but forgets to say that Armenian media cites 1news.az citing 525th. His real name is Karimlian, according to one source's source's source. Thank you Ali. I shared your article with my danish friends. I think your analysis is very real from a real life. I just so sorry about, that this kind of campaign is performed in our Mother Land.